This past weekend, unbeknownst to many here in the United States, the Wallabies (Australia) defeated the Springboks (South Africa) and advanced to play the All-Blacks (New Zealand) in the second semi-final of the Rugby World Cup. Over the past year, these three teams have been the most dominate in World Rugby. So the stage is set for another classic rugby battle between my Wallabies and the All Blacks. A match already sold out and being played in New Zealand at Eden Park. A field Australia has not seen success in 25 years. I’ll make no bets. I’ve lost far too many over the years. But I’m Australian and I therefore believe in the Wallabies. It’s difficult to describe the pressure associated with being a Wallaby or their coach. I coach for a college and represent my institution in competition. Some colleges have the weight of representing a State. 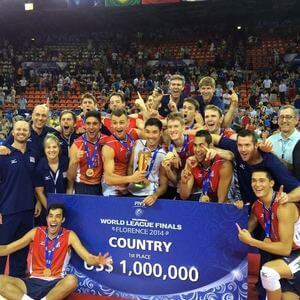 Only two volleyball coaches here in the United States represent their country in competition. But even those coaches, don’t have the weight of an entire nation on their shoulders when they go and compete. When the pressure mounts there are moments where you question what you’re doing as a coach? Have I done anything to help my athletes? Am I making an impact on my program? When it seems like the path is hard and the challenges many, what do we do? How do we respond? We can spend our time looking sideways – comparing our program to other programs. We can complain about our lack of resources, our budget, our feeder schools or our administration etc. Or we can become over-achievers. We can embrace the traits of the Wallabies – determination, courage, will power and a belief. There’s no guarantee if we do, we’ll beat our version of the Springboks or the All Blacks. But I’d like my chances. Sunday, October 16th – Australia Vs. New Zealand. Eden Park, New Zealand. Nice bit of inspiration there. I especially like the line, “We can spend our time looking sideways – comparing our program to other programs.”. I think I needed to hear that, perhaps I’ve been too envious and looking too much at the success of other programs instead of believing in what my kids can do. Thanks Jason, good words here. That comment struck me as well… As a new club director, it is so easy to look aside and say, “look what they are doing…” when really, I know what to do. I am always checking myself and reminding myself of who I am and why I have had success so far. The kids in your gym are there because they believe in what you offer… easy to forget that sometimes but nice to remember that we all have people who believe in what we are doing… we have to remember it too! Jason – After so many years of failing in the world’s biggest rugby event, it looks like the All Blacks have just two more hurdles to overcome…that the next is your beloved Wallibies, next door neighbors…or should I say neighbours…is what sport is all about. I strongly suggest that coaches reading the GM2 blog consider buying and sharing the Springbok story “The 16th Man” by ESPN. Powerful team stuff. In any case, looking forward to watching the showdown live. And hey Jason, spent yesterday with none other than Natalie Cook, who is going for her 5th Olympics in London. McKenzie and I taught her sitting vball on Sunday along with 100 other IOC Olympians and Paralympians in town for their 5th ever Athlete Summit, then she spent the day at USA Volleyball’s office swapping ideas and having lunch with my grassroots department staff at Bambinos- best Italian food in town… Another Ozzie doing good things in our sport, like you….good luck as your season winds down. I once heard Marv Dunphy say (in response to someone who was looking sideways) “the kids are in your gym, you just have to train them”. That inspires me to work hard for the kids in my gym. Jason, thanks for the great post! Thanks for your post, as a proud Kiwi and avid All Blacks fan, I’ll too be watching with great interest early tomorrow morning. I do admire the Wallabies for their fighting spirit and history of over achieving. Its amazing what can be done when everyone in an organization or team are all focussed solely on achieving the same goal.